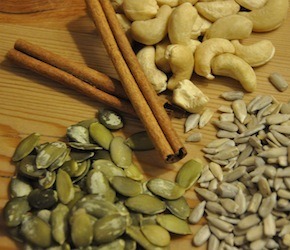 In a food processor pulse almonds and cashews to break them up into smaller pieces. Empty into a bowl and add seeds, coconut flakes and cinnamon. Gently melt oil and mix in coconut syrup and vanilla. Pour over dry mixture and stir to coat everything. Spread onto baking sheet and bake 25-30 minutes at 275F, stirring once or twice. Keep a close eye and be careful not to burn!! Sprinkle with a little salt and let cool completely before storing. This recipe keeps for several weeks in a cool dry place. Serve with almond milk and a sprinkle of maca root powder for a super charged breakfast or use as a gourmet ice cream topper.